The Supreme Presidential Election Commission (SPEC) has finally announced an official list of candidates for Egypt’s first post-revolution presidential election scheduled for 23-24 May. The final official list includes 13 candidates, including Ahmed Shafiq who was the last prime minister to serve under ousted President Hosni Mubarak. Shafiq was allowed to re-join the presidential race just one day after the SPEC disqualified him on the grounds that a law passed by the Islamist-dominated parliament on 12 April had stripped him of his political rights. The law denies political rights to anyone who served as president, vice-president, prime minister, or was a leading member of Mubarak’s defunct ruling National Democratic Party (NDP) for ten years before 11 February 2011. In a press announcement Thursday, SPEC secretary-general Hatem Bagato said the decision to allow Shafiq to rejoin the race was not politically motivated. “We decided that Shafiq should be allowed back into the race because he argued that parliament’s law denying him his political rights was unconstitutional and we decided that the law must be referred to the Supreme Constitutional court for a final judgement,” said Bagato. Shafiq, 71, is one four president candidates with military and police backgrounds. Shafiq was appointed prime minister on 30 January 2011 – five days after the start of the January 25 Revolution which toppled Hosni Mubarak. Shafiq was forced to resign in March under public pressure. A former air force officer, he also served as minister of civil aviation. Shafiq draws support largely from the military and police community and from former members of the now defunct National Democratic Party (NDP). Most of them believe that Egypt is in desperate need of a strongman to rid it of the post-revolution chaos and lack of security and that Shafiq is the best man to achieve this objective. Many also believe that Shafiq’s strong and forceful personality will help him stand up to Islamist forces, especially the Muslim Brotherhood. The other three candidates with military and police backgrounds have low-profiles. The first one is Hossam Khairallah, 67, a former intelligence officer who graduated from the military academy and was fielded by the Democratic Peace Party. The second is Mohamed Fawzi Eissa, 68, who is the candidate of the Generation Democratic Party and served as a police officer and then as a lawyer. The third is Mahmoud Hossam, 48, also a former police officer. The race includes three high-profile Islamist candidates. The first is the chairman of Muslim Brotherhood’s Freedom and Justice Party (FJP) Mohamed Morsi who registered for the presidential election one hour before the door closed on 8 April. Morsi, 61, was not intended to be FJP’s candidate, but after Khairat El-Shater, the Muslim Brotherhood’s business tycoon, was disqualified, he was fielded. Morsi, a former MP (2000-2005) is an academic figure who lacks charisma and many dub “El-Shater’s shadow." Morsi is a civil engineer from Zagazig, the capital of Sharqiya governorate in the Nile Delta. Morsi draws on the support of Muslim Brotherhood’s millions of supporters and members who would be pressured by the group’s leadership to vote for him. Morsi’s chances of success, however, could be reduced by another Islamist candidate, Abdel-Moneim Abul-Fotouh, a 61-year-old paediatrician who served as secretary-general of the Arab Medical Union. Abul-Fotouh was a popular member of the Guidance Office of Muslim Brotherhood for many years but he was expelled when he announced his intention to stand for president. Abul-Fotouh, however, draws on the support of the Brotherhood and other Islamist forces. Although he likes to describe himself as moderate, many civilian forces believe that he is Muslim Brotherhood’s unofficial candidate. Abul-Fotouh who is from El-Gharibya in the Nile Delta, however, enjoys the support of revolutionary movements who believe he stands in the middle ground between Islamists and secularists. A third Islamist candidate is Mohamed Selim El-Awa who likes to describe himself as an Islamist intellectual. El-Awa, 70, draws on the support of Islamist intellectuals, the moderate Islamist Wasat Party and professional syndicates. El-Awa, however, is disliked by the Coptic Christian community who accuse him of spreading hatred and lies against them. El-Awa was the former chair of the International Union of Muslim Ulamas. Moussa’s supporters come from all walks of life, particularly the intellectual community who reject Islamist forces. Moussa, however, is rejected by revolutionary forces who accuse him of being part of the corrupt Mubarak regime. 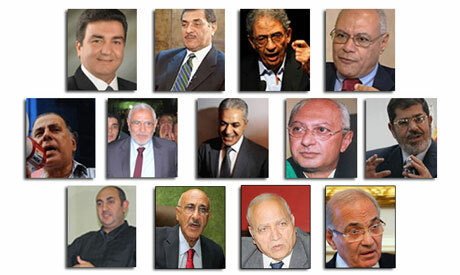 Two of the secular candidates are leftist: Hamdeen Sabbahi and Abul-Ezz El-Hariri. Sabbahi, 58, is a Nasserist who heads the nationalist Karama Party. Sabbahi describes himself as a student of late President Gamal Abdel-Nasser and his programme is mainly focused on securing social justice. Sabbahi is a critic of both Muslim Brotherhood and military candidates. Sabbahi said his base of support draws upon the millions of underprivileged Egyptians who live in poor villages, towns, city and slums. A third candidate, Hisham Bastawisi, was fielded by the leftist Tagammu Party although he is primarily a liberal. Bastawisi, 61, is a reformist judge who played a big role in exposing the Mubarak regime’s election rigging practices. He enjoys a limited amount of support from some revolutionary movements, the poorer classes and the judicial community. Abdallah Al-Ashaal, 67, is another secular candidate although he was fielded by the ultra-conservative Islamist Asala Party. Al-Ashaal is a long-time career diplomat with a PhD in international law. He resigned from the foreign ministry in objection to the corrupt policies of the former regime. Al-Ashaal, however, lacks any kind of support, especially after he announced he would pull out of the race in favour of El-Shater. The 40-year-old candidate Khaled Ali is considered the choice of the revolutionary movements. Ali, a socialist law and human rights activist, received the support of 32 MPs. Ali argued that his core of support comes not only from revolutionaries but also from workers, farmers and the unprivileged classes who want social justice. SCC and SPEC chairman Sultan said the election campaigns of the 13 candidates will kick off on 30 April. “This will last until 20 May or 48 hours before the vote on 23-24 May,” said Sultan. Each candidate was allocated a symbol. The three Islamist candidates Morsi, Abul-Fotouh and Al-Awa were given the symbols of a scale, horse and umbrella respectively. The four candidates with military and police backgrounds including Shafiq, Khairallah, Eissa and Hossan were given the symbols of a ladder, car, video camera and star respectively. The six secular candidates including Moussa, Bastawisi, Al-Ashaal, Sabbahi, Al-Hariri, and Ali obtained the symbols of a sun, watch, axe, eagle, pyramids and tree respectively. Each candidate will be allowed in the next two days to open an account with one of three national banks (National Bank of Egypt, Misr (Egypt) Bank and Banque du Caire) in Egyptian pounds to fund his election campaign. The funding cannot exceed LE10 million in the first round and LE2 million in a run-off round.